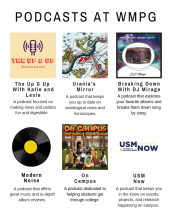 WMPG Podcasts Are Now Available For You To Enjoy! WMPG now has a large selection of podcasts for you to enjoy. We feature audio not heard regularly on WMPG’s airwaves. Check it out and maybe become a MPG’ Podcast Follower! Interested in live music recorded at WMPG’s studio? Lorenzo presents Podcast Open Mic(POM). This pod has over 50 episodes and features local musicians and more. Wonder what is playing at the cinema? Check out Film Time With Cody Curtis. How about what life is like on the road traveling the country? Check in with Mindy and her The Moving Cairn. Curious about what is happening at USM, you can check out USM Now. There’s a ton of interesting recordings waiting for you! Go to https://www.wmpg.org/podcasts/. Spring Begathon April 4 to 10: Celebrating 45 Spins Around the Sun! WMPG celebrates 45 years of Community Radio this Begathon, April 4 through 10. Our week-long Begathons are our take on asking for support from the listening community. Rather than viewing fundraising as a chore, we here at WMPG see it as a party for our station! It’s a radio soiree to keep WMPG strong and robust! It’s how we raise the funds to meet our operating budget. Everyday in the month of March WMPG is airing a short audio feature about an influential woman in history. We’ll hear women from Maine to Pakistan who’s fame ranges from Actress, Author to Activist. WMPG Fat Tuesday Cajun Cookin' Challenge Results! WMPG Community Radio presented the 24th annual Fat Tuesday Cajun Cookin’ Challenge on the Portland campus of USM on March 5, Mardi Gras Tuesday. Meet DJ Hope. Full of energy for community radio and so much more! DJ Hope is one of hundreds of volunteers who make great radio and keep WMPG strong and creative.